Due to some of the issues a few of our customers have been having, I have decided to temporarily put the e-store on hold. But don’t despair if you missed out; the book pricing has been readjusted (in a downward manner), so you haven’t lost out completely. Please don’t forget that monday is the deadline for the 2-for-1, £4 discount offer. Come Tuesday you’ll be regretting it otherwise! All being well, the e-books store should return this February with a rather tasty offer. Both books, during this period, will be available together for just £4 – that’s a saving regardless of which book you like the look of and you’re getting the other one as a bonus for free! Check back on Tuesday 1st February for more details! The only other requirement is that any review or preview – positive, negative or otherwise – must feature a backlink to the relevant page on the website. Again, the only restrictions apply to reproduction of the book content outside of ‘fair-use’. In other words, no reposting the entire book on your website, or passing a copy on to other people; and please don’t include lots of high-resolution ‘screen grabs’ of the book that are legible for reading off a monitor. 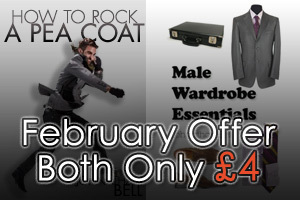 If you want to include a preview for your readers there’s an official sample of ‘Male Wardrobe Essentials’ available for linking/embedding via scribd.com; you can get the required code from the ‘preview’ page. Simply fill in the form below (or the one via the menu) to put in your request. It’s strictly one copy of one book per application; you can put in multiple requests for further/future titles, however these will be judged on a case by case basis; this is to prevent, for example, a single web operator from simply downloading the entire GuyStyleGuide canon and not printing a single review/preview. A 78-page guide full of tips and tricks for building an entire wardrobe from the ground up! Not currently available. ‘How To Rock A Pea Coat’ will teach you everything you need in order to sport a pea jacket with effortless style and panache. Not currently available.